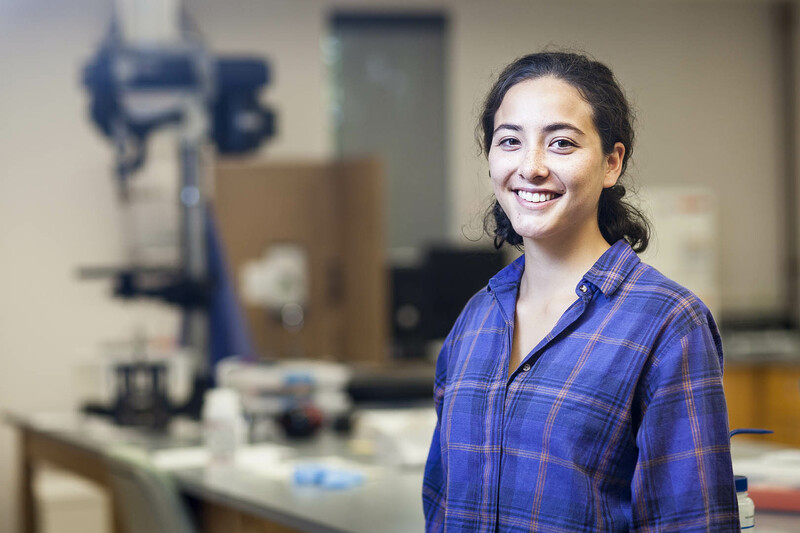 Here’s what it is like to spend the summer as a funded research assistant in a Bates geology lab that, among many other steps, melts chemical mixes in an oven at temperatures up to 1750 degrees Celsius, or 3182 degrees Fahrenheit. Summer funding: Science Fellows Program Faculty-Student Grant, part of a Bates program giving first-year students a solid introduction to STEM research. 1. Tell us more about your research project. It’s titled “Synthesis of Mixed-alkali Aluminosilicate Glasses,” and it’s designed to determine how changes in chemical composition affect the heat capacity and viscosity, or resistance to flowing, of certain types of glass. 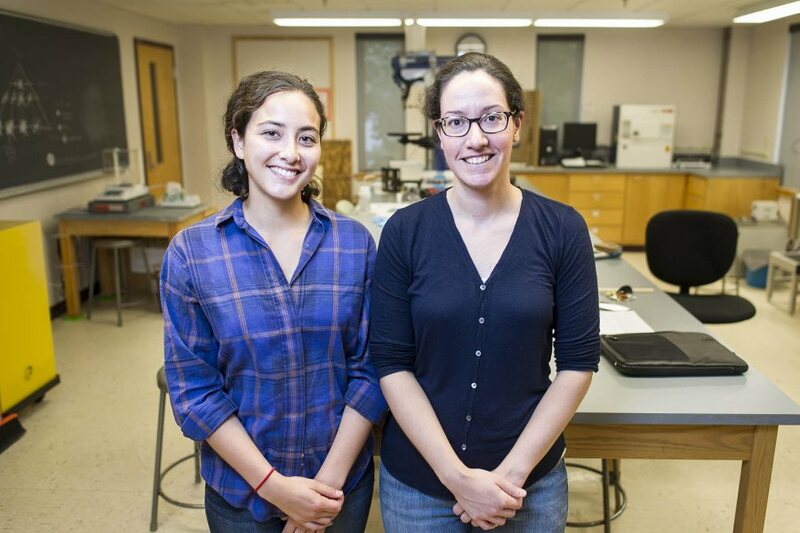 I’m assisting Rebecca Smith [a rising senior from South Freeport, Maine] with her thesis research and Genevieve Robert [Smith’s adviser, assistant professor of geology, and an authority on factors affecting how molten rock flows]. We’re synthesizing and preparing test samples of glasses with different chemical compositions. And we’re testing the viscosity, density, heat capacity of each sample. We’re looking to see more clearly the effect that the ratios of sodium, potassium, and silica have on viscosity, and therefore on the properties of magma within the Earth. 2. What are some of the overarching lessons you’ve taken away from this experience? In the lab, when we’re not actively doing something with our hands, there’s a lot of free time, which I use for reading geology literature about silicate glasses and melts. I realized this is a great chance to learn more about the experiments we are conducting, and that I should take advantage of this opportunity that I wouldn’t have had if not for the Science Fellows program. 3. How is this different from coursework? I don’t have assignments due, and Genevieve isn’t saying, “Hey, read this, do this.” It’s on me to use my time wisely and be productive. What I’ll be able to take away from this experience will reflect the effort I put into being a part of the lab. This knowledge is giving me more motivation and incentive to engage myself in my work, which I hope will carry on through the rest of my years at Bates and in life. The lab work has given relevance to things that I learned throughout high school about the whole scientific process — having a hypothesis, a purpose, making a clear procedure and documenting everything. People always laugh, “Do we really have to write everything down?” But you do. When I have to write about this at the end of the summer, or when Rebecca is writing her thesis a year after the first experiments were conducted, we do need to know everything that was done. 4. Genevieve and Becky Smith are serving as mentors to you. How is that going? Becky is a really good geology mentor, considering that I had very little knowledge of it and she was in the same place not too many years ago. I appreciate her presence as both an older student and friend who is able to offer guidance not only in lab, but also in classes and Bates life in general. Genevieve has guided me through a lot of what we’re doing and explained concepts in a way that I could understand without extensive background knowledge. Working with them has also shown me where I could potentially go. In a year at Bates, Genevieve has created a lab and found students to work in it, and maybe that will be the path I’ll pursue one day. 5. Why would you recommend someone do research over the summer? It’s your school, and the relationships you build with professors or other students over the summer — whether it’s with people in your lab or in another lab, or other students here in the summer — could really be beneficial. I’ve been in contact with other student science researchers on campus, but I wasn’t aware how many students on campus are doing things besides science research, such as economics research, working in our art museum, or working in the Lewiston and Auburn communities.